My zero waste ethic stems from my mother: she always rinsed and repacked the little resealable bags that held my peanut butter and jelly sandwiches, took 2-minute showers, and brought her own cloth bags to the grocery store. As an adult, I am known in my own house by the hoarded plastic film, and for always raiding the refrigerator to scrape together meals with dying leftovers. I’m also the person who can’t quite let go of things (‘A ripped set of sheets? That three-legged chair? There has to be something we can do with that.’). But What To Do With 32 Restaurant Kitchens’ Leftovers, Or 80 Three-legged Chairs? These are the bigger questions I get to tackle at my job, where zero waste goals are taken to a massive scale. 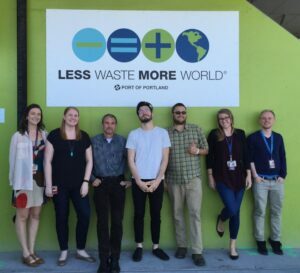 I landed a gig as the Outreach Coordinator of the Waste Minimization Team at the Port of Portland (OR), which operates like a small city and has one of the most impressive waste diversion programs in the country. The Waste Minimization program, part of the Port of Portland’s robust environmental management system, tackles diversion goals for all Port facilities through data analysis, outreach & education, and creative programming. Our main focus is the Port’s primary waste generator — Portland International Airport (PDX). With 10,000 employees and an average of almost 40,000 travelers passing through each day, PDX is its own metropolis… which means it generates a small city-size volume of waste. Luckily, a lot more can be diverted when it is coordinated communally. I’ll walk you through two examples of our Waste Minimization Team’s programming at the Port, followed by some practical tips for maximizing your own scaled-up impact to achieve zero waste. Since 2004, our Waste Minimization Team has invited any and all airport tenants and facilities to get rid of bulky, broken, or unwanted items on one designated day twice a year. The goal is to reuse as many items as possible. And to dismantle the items that cannot be reused into their recyclable pieces. You’d be surprised by what can amass at an airport complex in the course of a few months! The mountain of broken suitcases that the janitorial staff has been grudgingly stockpiling? We’ll break them down. That old refrigerator taking up space in your storage room? Those of us on the Waste Minimization Team will find a home for it. Outdated office electronics, or piles of scrap metal? We have every kind of special waste hauler and reuse organization in Portland coming in that day for pickups. During our last Fall 2015 event, we collected 8.9 tons of material! 76% (6.8 tons) of total materials were diverted from the landfill, 25% (1.7 tons) of which was diverted through reuse. But, without the coordination of one centrally-located event for all Port tenants to easily dispose of items, most of them would have likely ended up in a landfill. This model can be applied to other airports, malls, office complexes, business districts and neighborhoods. Our Waste Minimization Team started collecting food scraps at PDX as far back as 2003. 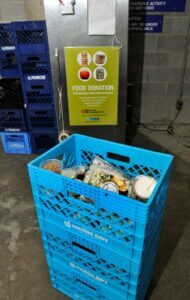 In 2013, after waste sorts at the airport terminal revealed high volumes of still-edible food in the compost bins, we went a step further and launched the food donation program. Think about any typical airport, teeming with grab n’ go shelves of fresh yogurt parfaits, egg sammies or deli salads. Now think about all of that food winding up in the compost, or worse, the landfill — if not sold in time to meet controversially high market standards. 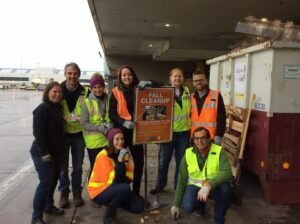 Our Waste Minimization Team works with a Portland-based organization, Urban Gleaners, who picks up food three times a week from PDX and distributes it to local food kitchens and low-income school districts. If any single airport restaurant was tasked with driving out to a food kitchen with a handful of day-old packaged tuna sandwiches, it could hardly be considered efficient, and it would never happen. But by operating as an economy of scale, our Waste Minimization Team can coordinate the airport terminal restaurants within one program, with amazing results. In the three short years since its inception, our zero waste food program has cycled nearly 100 tons of food back into the community (that’s almost 13,000 meals). Get a good team together. The individual members of our Waste Minimization Team have a diversity of interests, from data analysis to materials management to food systems. But we all unite under a common commitment to reducing waste at the Port. Draw conclusions. Through observation, outreach, data collection and analysis, we are able to identify the biggest waste problems, and focus our efforts on solving those first. Where along the chain is your waste being generated? Is it food, glass, or electronic waste? Make informed decisions to make the biggest impact. Give rewards. Our Waste Minimization Team is notorious for throwing pizza parties or giving out gift cards at every opportunity. We have an annual incentives program for composting, reward management staff for bringing durable mugs to meetings, and so on. Make as many people as possible feel good about what they’re doing to help your efforts, even if it’s a small gesture. They will remember it. Expand your network. We build relationships with the people who help us get things done: restaurant owners, Port concessions managers, regional waste haulers and recyclers, the Port maintenance and custodial staff, and so on. Knowing the ropes helps us understand how we can be an asset to other inhabitants of our little city, and what goes around comes back around to us. The Waste Minimization Team of the Port of Portland may look harmless, but they come with sledgehammers. They broke down 8.9 tons of materials to divert it from the landfill at the Fall 2015 Port Cleanup event. (Image: Grace Stainback). Make it consistent. Our cleanups happen twice a year at the same time. Our rewards program takes place during the same 3 months of every year. Keeping efforts consistent will increase awareness and commitment among the larger community. Have FUN. We try to keep all of our initiatives as fun and positive as we can. I know, this is a tough one. Follow this link to learn more about the Port of Portland’s sustainability programs and the work of its Waste Minimization Team. And link here to read The Port of Portland sustainability blog, entitled Port Currents. Posting Guidelines: This and other stories published on WeHateToWaste.com are intended to prompt productive conversation about practical solutions for preventing waste. Opinions expressed are solely those of the contributors and WeHateToWaste implies no endorsement of the products or companies mentioned. All comments will be moderated. All postings become the property of WeHateToWaste.com. Grace Stainback hails from sunny South Florida, where frustration with unchecked coastal development impacts- and a call to the wild- prompted her to flee to the opposite coast and begin a career in environmental planning and mountain living. She now resides in Portland, Oregon, dividing her time between completing a Master of Urban & Regional Planning degree at Portland State University, and brainstorming creative approaches to spreading the "reduce, reuse, recycle" gospel as the Waste Minimization Outreach Coordinator at the Port of Portland. In a previous life she was a freelance journalist and edited a sustainable building trade magazine. How interesting to learn about your behind-the-scene efforts to reduce PDX’s waste output! It is such a shame that, as you point out, social standards are so high and out of touch with the fact that resources are scarce when it comes to food especially that they ultimately encourage so much waste to be produced in the first place. Keep up the good work! I am late to the game reading these comments– thanks for the positive feedback! Unfortunately, the feedback I got from several restaurants is that food waste is “just a cost of doing business” therefore they don’t try as hard as they should to analyze the causes of, and minimize food waste. How can we shift the logic there? This was a really great article. Reducing the amount of waste produced on a small scale, in a family home, for example, is easy. The task becomes much more difficult, however, on a large scale when there are thousands of people on the go, all with different interests and priorities. Confronting this challenge is important because effecting large scale change is the only way to ensure a genuine long-term shift in societal attitudes and behaviors towards sustainability. Using an airport to set a framework to achieve zero waste on a large scale is the perfect case study because it is a microcosm of society in general; so much waste is created from damaged equipment and from single-serve food containers and products that allow people to eat on the go in our very mobile society. The garage sale is a great idea because it is an important resource for people who may be less educated in recycling and waste sorting, facilitates community engagement by allowing people to rally around a common cause to make their community healthier, and makes recycling, etc. easier and more accessible to people in the community. The food donation program is amazing, just shown by the stats presented in this article. The suggestions to achieve zero waste in your business or apartment complex at the end of the article are great because they show that achieving zero waste is a feasible goal and set a framework for how to achieve zero waste. The examples and suggestions in this article show that all we need to achieve zero waste are innovation, education, and community involvement. I am late to the game reading these comments– thanks for the positive feedback! Speaking of single-serve food containers, we are mapping out a new pilot project at PDX airport as we speak. For three months, we will offer the option of durable dishware in one food court of the airport which holds three restaurants (with the option to use disposable to-go ware if travelers desire). If it works we will try to make a case for it airport-wide! What do you think? This Waste Minimization project looks like a great idea! I like that this organization has set up opportunities for people to donate old items like chairs and refrigerators so they can be broken down and reused. There are many people who don’t want to throw things in landfills but simply don’t know where else to send stuff (looking at you, mom), especially if they’re too gross or broken for donation. Good luck with future projects! I love the idea of the partnership with Urban Gleaners! So much food gets thrown away because it’s considered “less than presentable” for society. Kudos to these guys for redistributing the (what would usually be) discarded food to people in need. This reminds me of the well-known argument for world hunger– that it’s not because the world doesn’t have enough food to feed everyone, it’s that there’s a SEVERE problem with distribution. A great example of how having a big community and tackling waste problems with an eye on economies of scale can work, too. Collecting still eatable food from the airport where there are a lot of shops gathered, makes a lot of sense for Urban Gleaners and reduces emission through transportation. I totally agree with Laura: it’s not primarily a problem of not having enough food, its about its distribution. With so much of the waste coming from those on the go with globally different backgrounds and experiences with recycling, I wonder what the contamination levels are and how your team educates the diverse contributors to the waste stream? What is your signage like and do travelers follow it? Portlanders are famously well versed on the proper ways to recycle and I wonder if this commitment to giving garbage a second life extends to the international passersby as well. Does anyone else want to send a link to this post to just about every airpot, stadium, and city in the country? Clear goals, easy-to-follow planning, and reward…the perfect storm for change. If only it worked for getting my husband to put away his dishes in the morning, too 😉 It’s so simple with such a simple goal…maybe I’m missing the reward part! ha On that thought, though, and on a more serious matter, I wonder if rewarding people for wasting is contributing to our waste problem. With the rise of food shots dominating social media that look unrealistically perfect, this might be part of the problem. Or when people are rewarded for finding the “best” apple or cooking the prettiest meal “Oh, this looks delicious”…maybe it’s time we reward saving food and being creative with what’s “left over”…even calling that something else. We need to change the story around food waste to food opportunity. I also completely agree on our need to change the philosophy of food! I suppose it begins person by person. thanks for your thoughts! This is a boundless concept that can be applied in any city and promote sustainability. 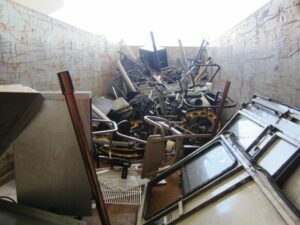 It is amazing to see the amount of waste (6.08 tons) that was averted from the landfill. If this was possible at one airport, imagine if this concept was used all across the world? Hundreds, to thousands of tons of trash, can be saved from going to a landfill. Also, the amount of food that was saved is also incredible. Portland has been on the leading edge of new sustainability innovations and this is yet another example. The tips for maximizing scaled-up waste minimization are a great outline for reducing waste. I am now interested to read more stories about this and see how it has been used around the world.